This past month has been such a blur! But it's been the most wonderful blur of our lives. That's because not only do we get to enjoy the presence of a new baby in our home, but we get to watch our son grow in his maturity as he interacts with her and with us during this most blessed time. Every day, we come to realize more and more how awesome our God really is. When we left the hotel room, the thought occurred to me that this would be the last few minutes that my family would consist of just the three of us. Therefore, we decided to take a picture before we left the hotel. As soon as we left the hotel lobby, we began sweating (you do alot of that in Nanchang this time of year) because it was so hot and humid. Certainly, we weren't nervous? I decided to test the video camera out before we got to the Center for Adoption, you know ... be prepared. Uh oh, humidity sensor goes off ... please shut camera down immediately to avoid damage. Ugh! Now what? Maybe it'll work again in the cool confines of the Center for Adoption (hahaha). Not. No air conditioning. So no cameras rolling. That's ok, we'll get lots of still pictures. Anybody seen the camera? Oh no! 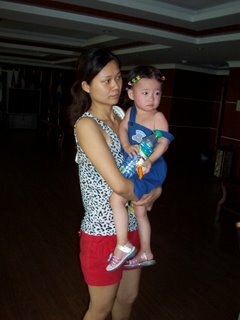 When we first saw the team bringing Jiang Yong Xing (Lily Grace) in to us, they were quite a ways from us. But it seemed like the next half hour went by in a split second. There was Jiang Yong Xing (Lily Grace) being held by someone we recognized from previous pictures (thank you Laura), while the director and our guide were asking us for our passports. What do you need those for, just give us our baby, she's crying ... anybody getting any of this on video or camera? 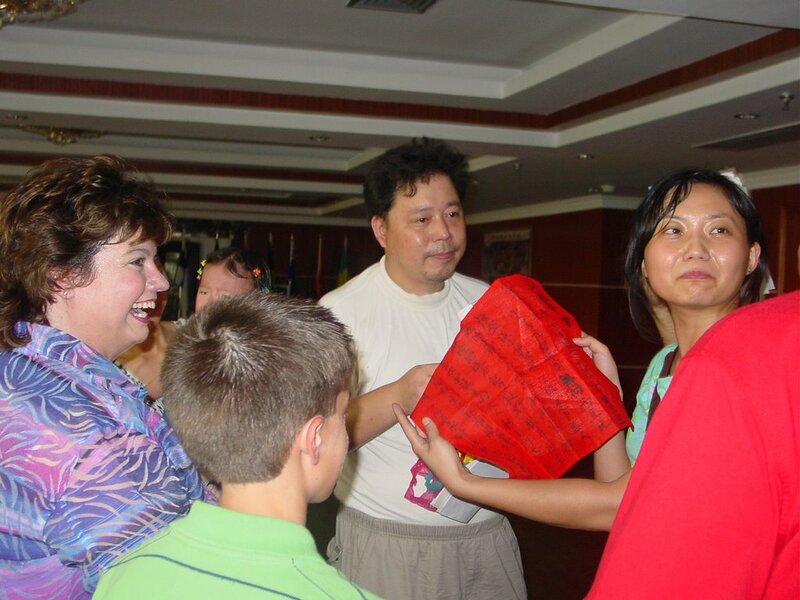 After verifying that we were indeed the parents, the director began showering us with gifts (tell you more about those in a later post) and in an instant, Connie moved in and took Lily Grace (Jiang Yong Xing) from the lady who couldn't seem to stop her from crying. We shook hands with the director and his team and exited the Center for Adoption as Green, Party of Four. Did anybody get that on video, camera, who has the camera, nevermind ... What a most amazing few minutes. 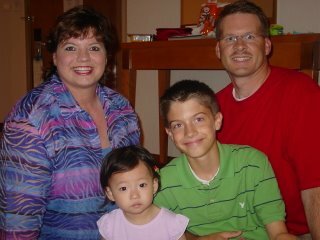 It was very much like the first few minutes that we had with Austin when he was first born. But at least then, we had the luxury of 48 hours in the hospital to learn how to comfort this new little being! It was hard to believe that it happend so fast after months of paperwork and preparation. 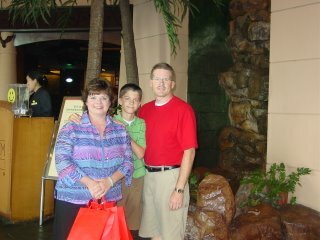 As a footnote, it turns out that Granny and Memaw had their cameras in full blown picture taking mode, so we did get some good shots. They also took pictures with our camera. The Director of Lily Grace's Orphange presents gifts to us - gifts that have very special meanings! Fast forward by one month. Lily Grace has become very much the princess of the house (the director told us they called her the princess at the orphanage!). She loves her mommy, her brother, and her daddy. She is now giving all of us kisses and hugs in abundance - God is so awesome! She has been sleeping in her own bed by herself for over a week now and she eat's everything in sight - run Little Cav, quickly!! Just kidding, she calls him kitty kitty and points to the basement door where he hides from her. 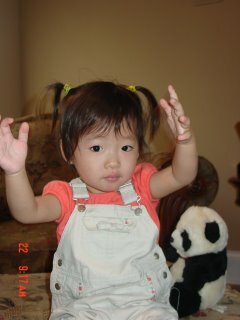 Things are going very well for her, so our prayers now go out for all others who share the joy of adoption with us. Especially those who have seen pictures, but are still waiting for Gotcha Day. Our advice ... take lots of deep breaths, breathe in, breathe out and enjoy the day. It is a day that your life will change for the better. Mommy, I love you this much! God is a Wonderful God. WOW! AWESOME!!! God is so Good! I enjoy reading your updates. Lily Grace is a beautiful little girl! God has truly blessed you. I look forward to hearing more and see more photos! Dinner and a Toy Store?